Winding through the Hemp Canyonlands, with a few great views of the cliffs west of Hemp Creek where the Hoodoos are located, lava cliffs known as the Birch Bluffs, you soon find yourself at the Clearwater River and the intriguing MacMillan cabin. If this log cabin dates to the beginning of this century, as some pioneers believe, it is the oldest structure in the Clearwater Valley. 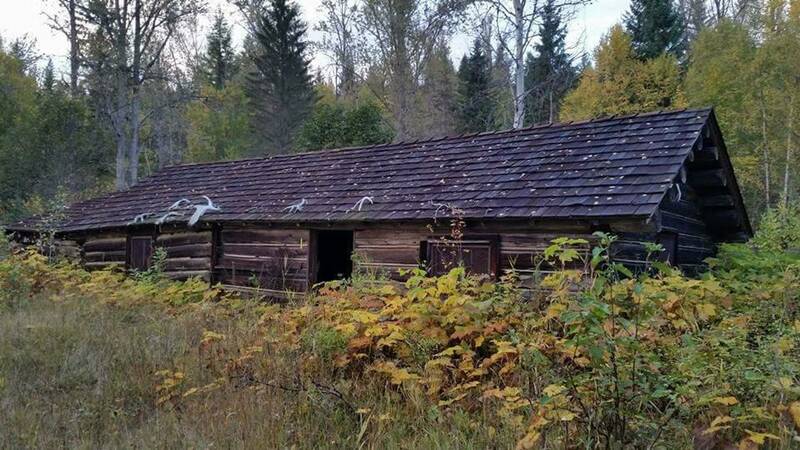 Nobody knows who built it or who occupied it at first, but the cabin was most likely the home base for a trapper and prospector because of its size. The papertrail of ownership began in 1921 when Oscar Horgen filed for a land grant and paid $1 for this 70 acre property at the meeting of Hemp Creek and the Clearwater River. He shared the cabin with Knute Anderson (no relation to Dave Anderson who lived by the road at Hemp Creek). Pete McDougal briefly owned this property but traded it for a bottle of whiskey in 1933. Forest Ranger Arthur Harby acquired the property in 1934 with the idea of operating fishing camps along the Clearwater River, and he also built a cabin at White Horse Bluff. H.R. MacMillan, owner of the Gigantic Forestry Firm MacMillan Bloedel, and Don Bates, owner of a Portland Insurance company, first discovered the abundant fishing in the Clearwater River in 1934 and came here once or twice a year for nearly 4 decades. Both needed stress release from the pressures of big business and found the Clearwater River was just the medicine they needed. The often stayed at this cabin, courtesy of the Harbys, and decided to purchase the property in 1949. Letters between Bates and MacMillan and to their Clearwater Valley friends, Mac and Cecile McDiarmid and Ida DeKelver, clearly indicate that this cabin was a very precious place to them. As MacMillan and Bates aged, their visits to the Clearwater River became less frequent and preservation of the property became their primary concern. In 1972, Bates wrote to the McDiarmids, "Years march on so rapidly it is hard to realize that it is time to do what we can and to at least help one small area be preserved for its wildlife and benefits of solitude for its few visitors." That October, they donated the property to the Benedictine Order of Monks at Westminster Abbey in the Fraser Valley. Westminster Abbey was selected as custodian because a good friend of MacMillan was W.W. Payne, a lumber exporter in Portland, and his son Robert was a priest with the Benedictine Order. The Paynes were keen outdoors-men and Robert (Father Damasus Payne) agreed to personally oversee the Clearwater River property. MacMillan died 4 years later at age 91. Then, in 1978, Father Damasus was killed in a mountaineering accident and property became just another of the Abbey's many holdings. After that, Bate's letters became increasingly frantic as he realized that their beloved cabin was not receiving the care they had envisioned. 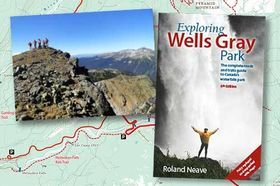 Since 1984, It has been leased to various commercial interests and is currently being used by the Wells Gray Riders Association as a shelter for their members to enjoy and is well cared for by dedicated volunteers and those of the Westminster Abbey. We are pleased to hold the lease for the River Cabin to date and would love to share the opportunity to all our WGRA members to enjoy. Please read carefully the rules and reservations for the use of the Clearwater River Cabin. All reservations will be on a first come first served basis and will be capped at 10 people unless otherwise specified. All reservations will not be guaranteed as private. Individual and Group reservations can be deemed private on a case by case basis. Information as well as a Key to entry. This key will provide you access to the Cabin kitchen and sleeping quarters as well as to the storage room. There will be a 2 night stay maximum unless otherwise specified. No above ground motorized vehicles are permitted on the Cabin property. Absolutely no fires (open flames) inside the cabin, and the cabin guests should follow the regulated fire bans for the North Thompson area. No fireworks on the cabin property. All food and perishable supplies must be stored in the mouse proof container provided at the cabin. A donation of $10 per person per night is recommended. A donation of $5 per horse per night is recommended. The event organizer will resume responsibility for any damages that occur during their stay, as well as ensure that what was packed in is packed out. The River Cabin is open to WGRA members only. All cabin guests must be a WGRA member in good standing prior to their stay. The River Cabin is open for the 2019 season on June 1st and will be closed on October 31st, unless otherwise specified.